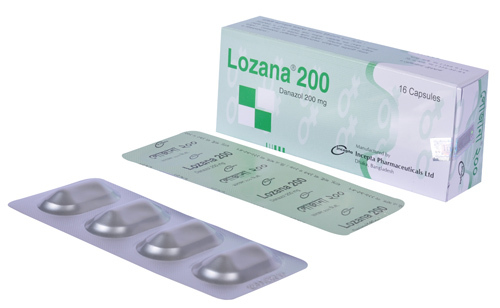 Lozana 100: Each capsule contains Danazol USP 100 mg.
Lozana 200: Each capsule contains Danazol USP 200 mg.
Lozana is a weak impeded androgen with associated anabolic properties. It inhibits gonadotropin-releasing hormone and gonadotropin secretion. This suppresses menstruation, inhibits ovulation, and causes regressive change in the vaginal smear and atrophic change in the endometrium. Danazol has no estrogenic or progestational properties. Preoperative thinning of the endometrium before hysteroscopic endometrial ablation. Lozana is available for oral administration only. Dosage depends on the condition being treated and the patient\\\'s response. For adults, the dosage lies between 200 mg and 800 mg daily in two to four divided doses. 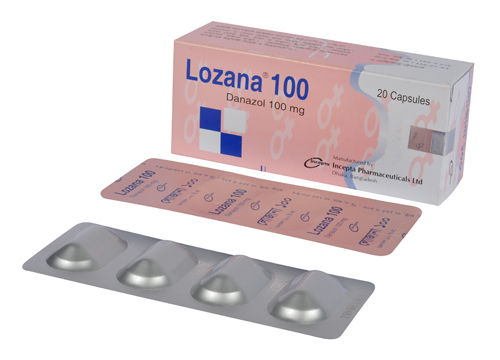 It is recommended that danazol therapy in adult females should start on the first day of the menstrual cycle with an adjustment of dosage made subsequently to achieve amenorrhoea or the desired effect. In endometrosis : The initial dose is 400 mg daily usually continued for 6 months. If symptoms do not resolve, the dose can be increased to 800 mg daily but the total course should not exceed 9 months. Benign breast disease: Severe cyclical mastalgia. The recommended initial dose for severe cyclical mastalgia is 200-300 mg daily for 3-6 month. In several studies, the initial dose of danazol was either 200 mg or 300 mg daily, which was reduced after either 1 or 2 months if a clinically useful response had occurred. Benign, multiple or recurrent breast disease: The recommended initial dose for this indication is 300 mg daily for 3-6 months. Menorrhagia : In menorrhagia, daily doses of 100-200 mg have been found effective but 200 mg daily is usually sufficient to reduce menstrual blood flow to acceptable levels. The recommended initial dose is 200 mg daily for 3 months. Gynecomastia: Adults, 300-600 mg daily. Adolescents, 200-300 mg daily. Preoperative thinning of the endometrium before hysteroscopic endometrial ablation : Danazol induces endometrial atrophy and is currently recommended at doses of 400-800 mg daily for up to 3 months preoperatively. Potentially life-threatening effects: None has been reported. Severe or irreversible adverse effects: If signs of virilization occur, e.g; voice changes or hirsutism, danazol therapy should be stopped immediately. Symptomatic adverse effect: Danazol has androgenic side effects causing acne, hair growth, oily skin, edema and weight gain, and these effects are dose related. Other adverse effects: Include menstrual disturbances, hypo-estrogenic symptoms, such as flushing, vaginal dryness and irritation and a modest reduction of spermatogenesis in the male. Maculopapular, petechial, purpuric and urticarial rashes have been reported. Cardiovascular reactions may include exacerbation of hypertension, palpitations and tachycardia. Various psychological reactions such as increased appetite, emotional lability, anxiety, depression, nervousness, changes in libido, dizziness, vertigo, nausea, headache and fatigue have been described.